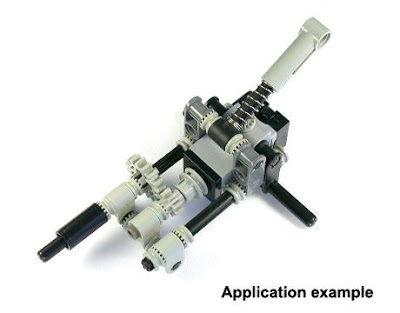 TechnicBRICKs: Minimotor - A great custom motor! There is a friend in US/Florida (Mauricio), who developed a great motor, made of LEGO original parts (except for the motor itself). This costumized Minimotor can be be found at iLegos (his store at eBay). See it here. 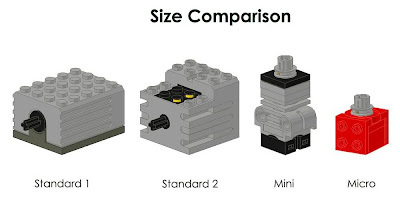 Below you can see an image/size comparation with some other LEGO motors. 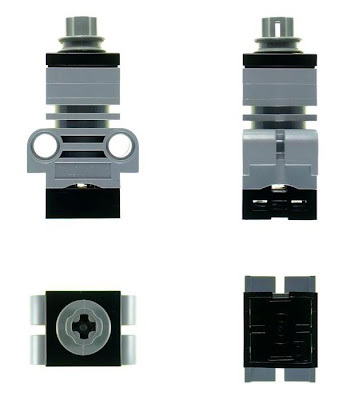 Versatile chassis design based on standard LEGO parts, which allow compact and strong connection to other LEGO elements. Specially adapted for connection to studless designs. This motor size fits between old LEGO micromotor and common 9v LEGO motors, however it delivers great torque at comparable rotation speed. Despite new Power Functions motors, this is still very actual, unique and powerfull for its size. Personally would like to see it compared at Philo's page. Maybe someday Mauricio an Philo, give us such pleasure. See it in action and get some, as I did! Yuo can find some more nice custom parts at iLegos, some of those I'll highlight here in the future. Update on 2008.Jan.21: iLegos stopped producing and selling this motor with the advent of LEGO new PF motors. Most likely you will not see them at eBay anymore, at least from their original producer. Quite nice indeed! Maybe this custom motor is comparable, in dimensions and performance, to the new Power Functions medium motor, but useable in standard 9V applications? I too hope Philo tests this little powerhouse. My only gripe with it is that it seems to me that its attachment points are a bit too far from the output, so lateral forces might harm it.